Danish Army Specific: Delivered by the British forces in Germany just after WW II. The trucks were all used and went through a repair-program at Air Base Skrydstrup (where the picture is taken) before proceeding to the end-users. A further batch was bought in Great Britain. Besides the GS-version the QL was equipped as mobile workshop, stores, signals and similar. Danish modifications included US pattern black-out marker lights, rifle holders and lowered positioning of the headlamps. They were gradually superseded by the Bedford RL-series starting in the late 1950´s, although specialised vehicles continued to soldier on into the mid 1970´s. 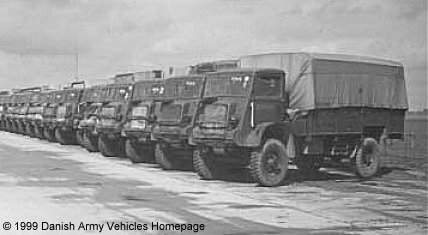 Historical: At the outbreak of WW II, Bedford was contracted by the British War Office to produce a 3 tons 4 x 4 general service truck. A pilot model was ready in February 1940 and quantity production started in March 1941. Used in a range of roles including Bofors tractor, troop carrier, cargo, tanker, communications, fire tender, field kitchen etc. More than 50.000 produced at Vauxhall´s Luton factory between 1940 and 1945. Width: 2.26 m (89 inches). Height: 2.54 m (120 inches). Weight: 7.000 kg (15.400 lb.). Engine: 6-cylinder Bedford, 3.519 cm3 (214 cubic inches) displacement, liquid cooled. Horsepower: 72 at 3.000 rpm. Tyres: 10.50 - 20 (11.00 - 20). without preparation: 0.4 m (15 inches). Fuel capacity: 127 liter (28 gallons).